The aim of this focus area will be to identify and modify chemo-attractants as well as material properties in order to optimise cellular migration to sites of regeneration to enhance the healing process. Following injury, complex signalling cascades are initiated to attract and contain cells required for the activation and successful completion of the healing process. 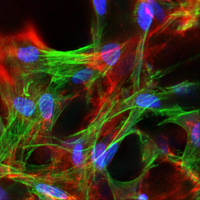 A promising strategy to enhance regeneration is the use of biomaterial scaffolds in combination with chemo-attractants to foster cell migration. The properties of the scaffold and the nature of chemo-attractants play a crucial role in the recruitment of the cells to the site of injury but, so far, their nature and influences remain unclear. Signalling pathways and relevant modulators of migration will be investigated on a molecular level (Dragun’s, Lauster’s and Knaus’ labs). Genetic animal models (transgenics, knockout or knockdown technology) will be generated (Bader’s, Mundlos’ and Leutz’s labs) for in vivo validation of migration principles of cells. Bioinformatic analyses will allow a correlation between the in vitro and in vivo models (W1 from FU jointly with Schütte's labs). The stiffness and geometry of native tissues will be characterised (Fratzl’s lab) to study their qualitative effect on guiding migration processes. Satellite cell recruitment after muscle fibre injury will be also investigated (Spuler’s lab). The understanding of native tissue guiding from these studies will serve as a blue print for the design of artificial scaffold structures. The W3 professorship on cell-matrix interaction will complement this expertise by introducing a cell biological perspective. The materials shaping the migratory activity will be optimised with respect to chemokinetics and chemotactics (Mooney’s lab) and geometry and stiffness of 3D scaffolds will be modulated (Lendlein’s lab) and characterised (von Klitzing’s lab). The migration of cells into the site of injury will be analysed in vivo (Duda’s lab) by using these scaffolds in experimental void fillings (e.g. femoral defect healing). The role of chemokines in the recruitment of inflammatory and regulatory cells during cardiovascular diseases and ischemia will be analysed in an experimental setting (Bader’s, Stamm’s, Tschöpe’s and Sawitzki’s labs).